Draft City of Sydney Employment Lands Strategy – Tamara Bruckshaw, Senior Specialist Planner. Employment Strategy needs to balance a number of objectives. Land zoned for industrial use is less valuable than land zoned for residential, so land-owners are keen to see rezonings. At the same time, increases in the price of industrial land drives industrial activity further west, and much of this activity is supporting other activities in this area, for eg, the Green Square development needs a large supply of concrete. If that isn’t produced locally, it needs to be trucked in from elsewhere, with all that implies for increased congestion and polution. The government requires the City to plan for an increase of 109,000 jobs by 2031, mostly in the CBD, with 7,000 planned for the Green Square area. Overall, the balance is shifting away from industrial, and towards commercial and mixed, although mixed includes residential, so the effect is likely to be much the same as if it were zoned residential. There are currently two proposals under consideration, the Sansom review, and the Metro Strategy. They both propose mergers, but different mergers. Neither provides a cost-benefit analysis of mergers. Unlike, for example, Brisbane, the expanded council would not have the authority to develop infrastructure, and remember that the current State Government will not allow the City the authority to build even a bikepath. What makes the Metro Strategy different to what has come before is the New Planning System – it gives the Metro Strategy far more power. It allows developers to override Local Development Plans, and probably allows them to ignore Heritage concerns as well. Under the proposed new planning system, the ability to comment on Development Applications will largely be lost. In theory, there will be a period of consultation on the rules that future Development Applications will have to comply with. However, even though the new planning system is not yet in place, the Minister for Planning and Infrastructure is already exhibiting the Draft Metro Strategy for Sydney. This is the document which will become the new Regional Growth Plan for Sydney. The Minister for Planning and Infrastructure has formally refused requests by BPN (the Better Planning Network) to suspend the exhibition of the Strategy until the new system is in place and community engagement can be adequately resourced and conducted. Please consider signing this petition. For the government to proceed with this exhibition without the opportunity for proper community consultation would be to express contempt for the very legitimate concerns residents have. Planning Law Changes – Public Forum, Monday 27th. 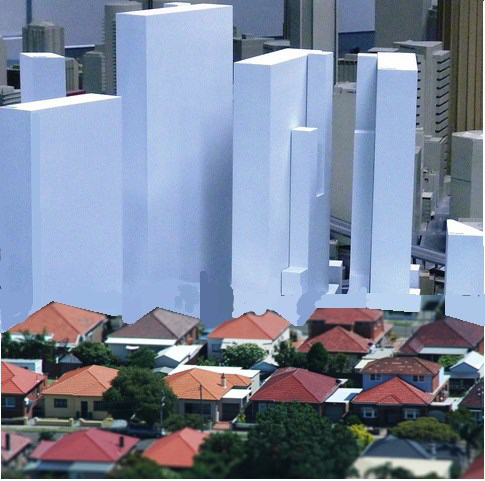 The planning system is changing and many more developments are proposed for the inner city. Our current right to comment on DAs will be removed for 80% of developments including many high-rise. Developers are happy about that but are we? Come and show you care and hear about how these changes will affect us and how to have your say. Forum jointly organised by REDWatch and ARAG. 10am this Monday, 20 May at Parliament House (only a few places are left).If you wish to attend, please email betterplanningnetwork@gmail.com.